.... Now how exciting could that get !! Idlis are a saviour both in terms of time and health in my family. I do keep trying different varieties of these steamed delicacies, and today’s dish was more an experiment that everyone loved ! Sevai-Rava Idly, or Vermicilli- Semolina Idli accompanied by Tangy Coriander Chutney made a complete meal by itself. And what’s more, it added a variety of Idly after Toor Dal Idly, Mini Carrot Idly, Pepper Idli, Poha Idli etc. Makes for a filling breakfast as well as a healthy lunchbox option. Blogging Marathon under “Meals under 30 mins” & Valli’s Mela under the same name. Also to Anu’s South Indian KitchenSeries. The last two days dished under this theme included Poori-Choley & Wholewheat Cheesy Pizza. Today, I must make an exception. And that is to publish a post without any words,although I couldnt do away without an intro. This dish has been my dream ever since I saw various other bloggers make a pizza from scratch. It did take me a while to get the wheels running, but I was glad I tried it. And I did do it ! And guess what ? More than my kiddo who was mighty pleased with this weekend treat, I did a little jig myself. The pizza came out uber soft, healthy and delicious. I am running down the ingredient list, and the pix are, hopefully, self explanatory. Check out the other marathoners here. Whats in a Poori, one might ask... Well, first as a family we don’t eat Pooris that often. Two, I dnt remember the last time I made this all by myself from start to finish. And thirdly, I didn’t know how to puff them, restaurant style. So, armed with these newly acquired skills, I was ready to make the perfect Poori, and accompanied by the perfect side dish – Punjabi Choley , or spiced Chickpeas curry. There is of course the fattening cousin of Poori, which is made from Maida or APF, called the “Bhatura”. But as this was to be for a quick lunch meal, I chose to make the former. Kiddo looked at me impatiently waiting for the clicks to be done, and while she dug into it, gave me a thumbs up sign that she liked it. This goes to BM under “30 min meals” & Valli’s Mela under the same name. You can make this for breakfast or lunch too. Off to the recipe now. Do you feel sometimes you are in a time warp, where everything around you flies in a frenzy and you have little or no control over what happens around you ? Of late, things around me seem just like that. With kiddo’s school reopened two months ago, I am caught in a whirlpool of activity on the personal front, not to mention that many days when the hunger pangs strike me around noon, I realise I need to rustle up something for lunch. And today was one of those days, when nothing seemed to get done : the housework, errands that I needed to run, my professional commitments, and I was in absolutely no mood to dish out anything elaborate. Which is when this yummy and tangy coriander chutney (aka Kothamalli Chutney) saved me. I couldn’t help smile a mile long : this definitely meant lesser dishes to do, and even lesser cooking. Quite a treat, this tangy chutney from the morning’s breakfast went well with hot steamed rice, and with a few roasted papads, I was singing like a lark. Quite a breeze to make, this is adapted slightly from Priya’s Coriander and Onion Chutney, except I didn’t add Onions and modified a few other ingredients. I had already blogged my grandmom’s signature recipe Kothamalli Thokku and Mint-Coriander chutney for Chaats,so my favourite ingredient being coriander, I chose this recipe from her blog. 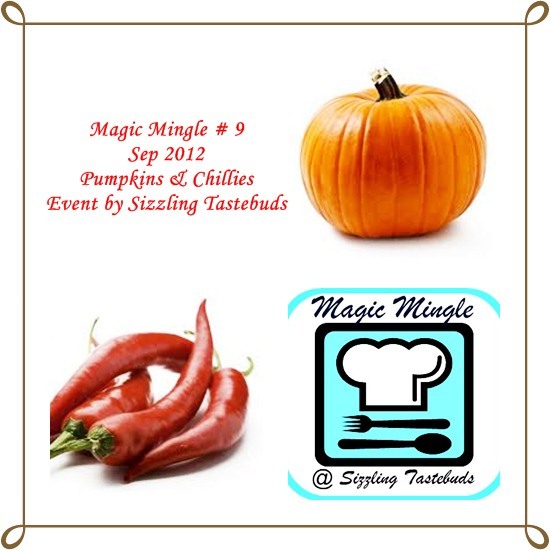 32 mouthwatering entries for Magic Mingle # 7-- thanks dear members for your enthusiastic response.Top Contributors for last month were: Priya Suresh with 7 entries and Roshni with 5 entries respectively.. Way to go, girls !! 1) All dishes to be vegetarian & eggless only (non-veg/ alcohol etc not accepted). 2) Only new entries are accepted and any number of new entries per member are accepted. 6) Once you post & link your entry (using the linky tool at the end of this post) between 5th & 15th of the month,mail the entry URL to the google groups email ID - magicmingle@googlegroups.com with the subject line "MM-Aug 2012". Please remember these two ingredients must feature as one of the main ingredients for the SAME DISH and not as garnish. Hope you are excited and would link your entries soon.If you are unable to link your dish, please mail me at our googlegroup email ID. Desi – Videsi Khana. Or in simple english, fusion / crossover food. 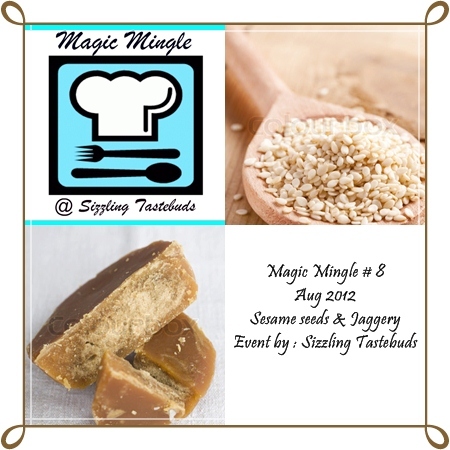 That's the theme of the food fest here at Sizzling Tastebuds, all this August. As India enters her 66th year of Independence, and we have many festivals like Raksha Bandhan, Ramzan, Janmashtami this month, what better way to celebrate than with the festival of food. With a twist of course. Desi – Videsi Food Fest encompasses all those foods made with a twist or even fusion food. So fusion and crossover food like Rice flour pancakes, Paneer Manchurian,Rajma burgers, Broccoli samosa, Channa Dal Subway sandwich, Cornflour jalebis, Baby Corn Pakodas, Couscous Koshimbir with Tadka...I am just getting some ideas here...– so think food with a twist,fusion food – and those cooked with a crossover ingredient. Let your imagination run wild, and send in your entries linking them to the Linky tool at the end of this post. Food can be of any cuisine across courses. But only eggless and vegetarian recipes please. 1) Link all entries using the Linky Tool here. 2) Upto 2 old recipes reposted and linked to the event announcement allowed.